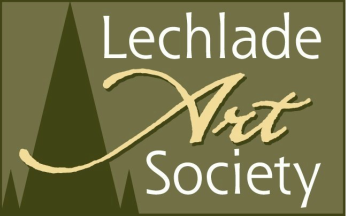 Early in 1986 a small group of enthusiastic amateur artists under the leadership of Tom Askwith discussed the formation of an art society in Lechlade. Tom, an amateur artist with many years experience, had given beginners classes as a fund raiser for St Lawrence Church the previous year. So under the chairmanship and guidance of Tom, the Society was formed and soon grew to a membership of 100 with an active working committee. Lucy Cleeve was the first president until her death in 1989. Tom was then invited to become president and Ted Pierce was elected chairman of the Society. In 1992 Ted stood down after three more successful years and Lin Collier was elected the Society’s third Chairman. In 1990 thirteen members designed and produced an illustrated map of Lechlade. This was reproduced and 100 copies were sold as a limited edition, enabling the Society to give £100 to the Parish Church clock fund. The original painting now hangs in St Lawrence Church in Lechlade. Joan Liller of Lechlade (pic above with Lady Faringdon) was one of the founder member of LAS in 1986 and was elected, President of LAS. Sadly, Joan passed away on the morning of 1st June 2015. Anne Snow, also one of the founder members, is now our President. The Rt Hon Lord Faringdon is our Patron, a post he has held for a number of years. The Society presented its first exhibition in the summer of 1986 and this has been an annual event since, with growing success. It is always pleasing to see newcomers exhibiting their work for the first time at the exhibition which is generally held in the Memorial Hall in August. The Society does not have a selection committee so the choice of work exhibited is that of the artists giving a varied and interesting exhibition. The Society depends on the active involvement of the membership for its continued success. It is therefore hoped that all members will participate in the various advertised events and give their support to any appeals for assistance with the Society’s activities. A particular aim of the Society is to encourage beginners, and many classes have been arranged to teach and improve members’ skills in their chosen medium. In addition established members have had the opportunity to widen their skills base by trying new methods of working in new media or revisiting old techniques and processes. Activities throughout the year include a varied programme of talks and demonstrations by invited professional artists and speakers. The Art Society also encourage members to give talks and demonstration in their own area of expertise and such events are well supported by all. Workshops, outdoor painting sessions and an annual trips to London to visit a major exhibition are also enjoyed by the members. Click contact form below to send a request for more information. for emails to a LAS Committee Member, please use the form or link below.